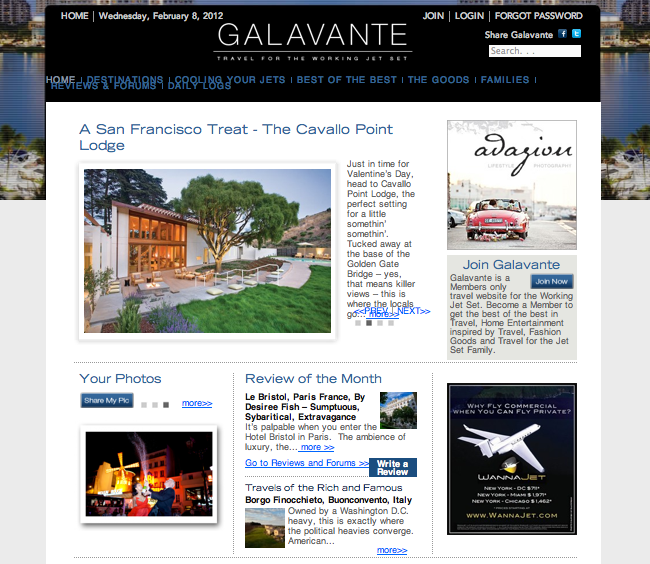 Galavante is a great new online travel resource and forum for the “working jet set:” anyone who works hard and plays hard, prefers trip practicality, loves to be pampered at the finest hotels but also likes to take advantage of their hard earned mileage and points! Their personal and experiential recommendations are stylishly inclined and come in the form of smart articles, engaging videos and beautiful photos. I love their daily travel logs and newsletters, and have gone to their “Families” section for advice when planning a vacation. Galavante not only tells you where to go, stay, eat and play-they even give you great tips on what to take with you on your fab trip!